The stock jumped 18 per cent to Rs 266 in the intra-day trade, bouncing back 21 per cent from its early morning low of Rs 219 on the NSE. 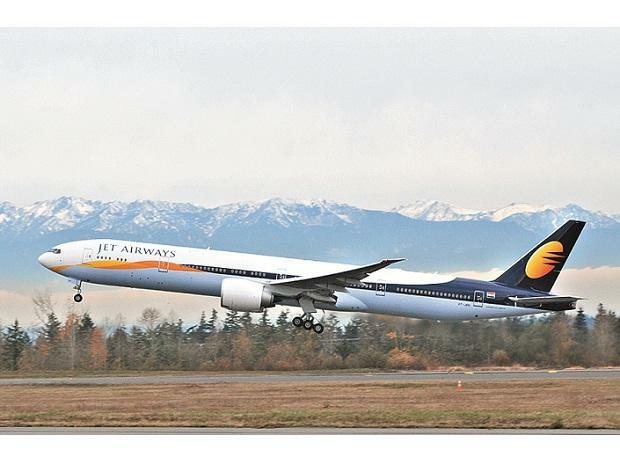 Shares of Jet Airways (India) jumped 18 per cent to Rs 266 in the intra-day trade on Monday, bouncing back 21 per cent from its early morning low of Rs 219 on the National Stock Exchange (NSE), after the company announced Chairman Naresh Goyal and his wife Anita Goyal have quit the board of the airline. The company made announcement after market hours. The stock finally settled nearly 13 per cent higher at Rs 254.50 on the NSE. In comparison, the Nifty50 index was down 1 per cent at 11,354 points today. The trading volumes on the counter more than tripled with a combined 46.6 million shares, 41 per cent of the total equity of Jet Airways changing hands on the NSE and BSE. The board of directors of Jet Airways at its meeting today i.e. March 25, 2019 approved the resolution plan being formulated by a consortium of domestic lenders led by State Bank of India (SBI). After the board meeting, Jet Airways informed stock exchanges promoters of the airline, Naresh Goyal and Anita Goyal, and one nominee of Etihad Airways PJSC have stepped down from the board. As the per resolution plan, Jet Airways will issue 114 million equity shares of the company to lenders upon conversion of Rs 1 of the outstanding debt.